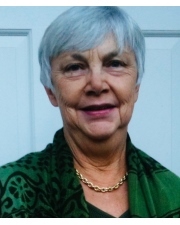 Jean M. Harum died on January 23, 2019, during emergency surgery. She is survived by her son and daughter, Albert Harum-Alvarez and Andrea Harum Schiavoni, and their spouses, Enid Harum-Alvarez and Tommy John Schiavoni, as well as her grandchildren Gabriel, Gianna, Marjory, Anna, Thomas and great grandson, Dominic. A wake for Jean will be held at Stanfill Funeral Home on Sunday, January 27th from 4 to 6 PM. A Funeral Mass will be held on Monday, January 28 at 11 AM at Saint Thomas the Apostle Catholic Church. In lieu of flowers donations may made to The Long Island Musical Theatre Festival at rexarts.org or the Saint John Vianney college seminary at semssp.org.